Portable USB chargers are incredibly useful for adventures in the great outdoors, festivals, traveling, or if you are out-and-about all day. 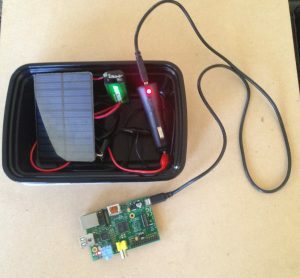 Adding in a solar panel provides an additional source of portable power useable (nearly) everywhere. The whole project can be built for ~ $20, even if you don’t have a soldering iron! 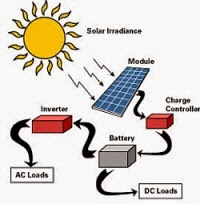 Suggested to use a low-power solar panel, typically if you are not using a charge controller . This protects the solar panel by allowing current to flow only from the panel to the batteries (aka prevents discharge from the batteries onto the solar panel). If you choose a similar diode, be sure it works w/ the given solar panel specs (voltage/current output). Project container (e.g. tupperwear, altoids tin, cookie tin, etc.). Be creative! Scissors also work. To strip the wire, make cuts on both sides and pull off insulation w/ your fingers. 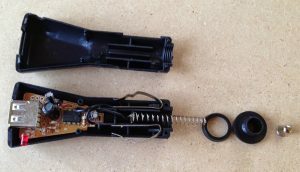 Other methods for making electrical connections: twist wires together and coat in epoxy. Other connections can be MacGyvered together; take apart old electronics for connectors and wires, use paperclips, and be creative w/ conductive objects like pennies. Multimeter, if available. Massively helpful for testing electrical connections and checking if the circuit works as expected. Handy in remote locations (like Burning Man..). Lifetime of 25 – 30 years. 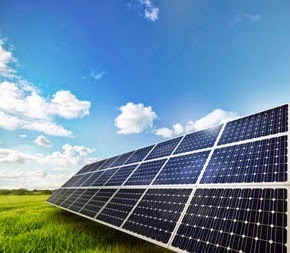 Solar panels, or photovoltaic (PV) panels, output direct current (DC). Digital devices, like cellphones or iPods, run on DC. This means our charging circuit is fairly simple. As in the photo on the left, we need a panel, a battery, and our device, or load. Charge controllers regulate current flow primarily to protect the battery. We can avoid using one in our USB charger, but they are ideal for larger systems. The solar charging system works w/out the batteries. The batteries are there so you can use the system whenever you need it. As shown in the photo to the right, USB chargers have 4 pins. 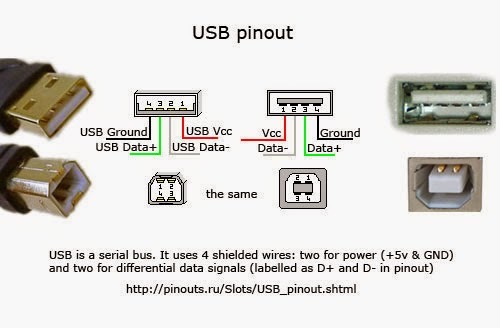 All USB chargers output 5 Volts (V) DC on the USB Vcc pin. However, the amount of output current depends on the type of USB charger. There are three main types: a standard downstream port (500 mA), a charging downstream port (1500 mA), and a dedicated charging port (900 mA). Apple USB is a bit trickier (unsurprisingly..); one of the data pins is set to 2.7 VDC. So, if you finish your portable USB charger and you want to charge an iPhone or iPod, you need to increase the voltage (aka use a bigger battery.. or two 9V batteries connected together in series. Note: if you are using the epoxy method for connecting wires, wait until after you’ve tested the whole system to coat w/ epoxy.. epoxy is rather permanent and once it is set there is little you can do besides curse at it (won’t really help, but might make you feel better!). Strip wire on end of solar panel (remove colored insulation to expose the metal). No leads on the panel and there’s no soldering iron?! It’s all good! Get creative. Here’s one way: tape two wires onto the metal pads on the back of the panel w/ electrical tape (colors don’t really matter, but convention is red = positive and black = negative). 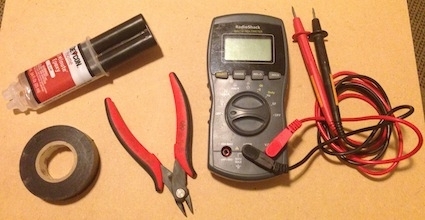 Test it w/ a multimeter, or by connecting the leads to the USB car charger to make the “charging” LED light turn on. Coat in epoxy, let dry & you’re done! 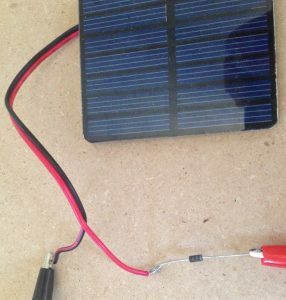 Connect diode to positive end of solar panel lead. If possible, solder the two ends together. Otherwise, twist wires & coat in epoxy at the end. Super important: install the diode so that the side w/ the silver band is connected to the battery, like in the photo to the right. Connect diode to positive (red) side of battery holder. 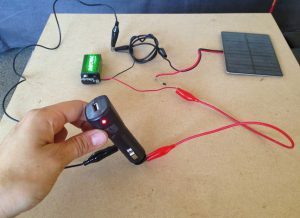 Connect negative (black) solar panel lead to negative battery holder lead. The front metal part of the USB car charger is the positive terminal. One of the metal side tabs is the negative terminal. Determine which side of the USB car charger is the negative (or ground) side. — Open up the charger; see which metal tab is connected to a wire. — Use the panel to turn on the charger. Connect the positive battery/solar panel lead to the front metal lead. Touch the negative battery/solar panel lead to each side. The side that causes the “on” light to light up is the negative side. Connect the negative battery/solar panel lead to the negative tab on the USB car charger. Connect the positive battery/solar panel lead to the front metal lead on the USB car charger. There are a few ways to do this, depending on your available tools and materials. The easiest way is to use alligator clips (and coat them in epoxy when it’s all done & tested). Test it! Connect a USB device (like the Raspberry Pi!!) and make sure it lights up. If it works, epoxy all the electrical connections, put it into a container and take it w/ you on an adventure! Once your first version works, make upgrades and modifications as necessary! Google is super helpful. In 2012, average costs of solar per watt were between $1 – $2, with some as low as $0.70 per watt. Although this does not include the cost of additional equipment (e.g. batteries, transformer for AC applications, mounting system, etc. ), it is beginning to seriously compete with fossil fuels. Yay, solar!! 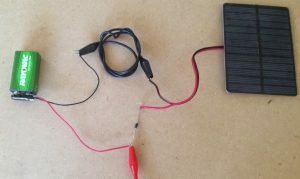 **Why a 9 V battery? ← Blinking Light(s) with the Raspberry Pi! This is awesome! I would love to have a portable solar powered charger for my adventures. I enjoy backpacking and photography. I often times find myself needing to charge my cameras batteries but I don't want to lug around a large portable power supply. A smaller solar powered charger would be really awesome. Thank you! I designed this project b/c I was disappointed at how expensive portable solar chargers are, typically upwards of $90. Everybody should be able to charge their batteries, phone, etc. for a reasonable cost! The issues involving usb charger has been a popular topic amongst scholars for many years. Underestimate usb charger at your peril. Until recently considered taboo amongst polite society, spasmodically it returns to create a new passion amongst those who study its history. Inevitably usb charger is often misunderstood by those politically minded individuals living in the past, many of whom blame the influence of television. Complex though it is I shall now attempt to provide an exhaustive report on usb charger and its numerous 'industries'. Hi! This is a great idea! What kind of rechargeable battery are you using? And how many battery can work in parallel connection? Let me know if you have any questions + happy building! Its nice, but I am disappointed with the use of a battery. That kind of defeats the purpose of being able to be totally green, ie. not having to rely on any power source other than solar. So you are saying the reason the 9V battery is needed is bcoz the solar panel alone isnt able to generate 12V? It generates about 3V, and you supplement it by adding 9V in series to push it up to 12V to be able to drive the car USB charger? Did I get that right? A circuit schematic would help too. Thank you for the feedback. Re: battery, any form of energy that relies on weather requires a way to store energy, as weather is unpredictable and, in the case of the sun, isn't shining when you need electricity the most. Also, even renewable energy technologies aren't fully "green," e.g. PV panels are made from rare earth metals and generate GHG (greenhouses gases) when they are produced, not to mention that they are incredibly expensive to make. So, the idea of going "100% green" is impossible unless you give up electricity altogether.. In fact, I would argue that the term "green" is very misleading and just a buzzword that doesn't actually mean anything. Re: PV panel, in my design, the panel is ONLY charging the battery, it has no effect whatsoever on the USB charger output. The battery is there so that you can charge your phone whenever you want, including at night. That said, this design will work without a battery. I was able to charge my iPhone w/ a 20 W panel (20 V) in full sunlight w/out a battery. So, if you don't want a battery you can just get a higher power PV panel (> 10 W, 12V), but be aware that it will only work in full sunlight. Absolutely, happy to help! Also, thanks for the reminder about the schematic, it's been added to the start of the "Build It" process. Let me know if you have any more questions. Yes, I noticed the schematic, thanks. I am just wondering, it might be a better idea to advertise this circuit *without* the 9V battery. Reason: After constructing it, sooner or later, people may start using it in their road trips, and the tendency may develop to leave it unattended in the car (maybe even accidentally). Wouldn't a battery get too hot in a car left in the sun, and eventually explode? No. There are many types of batteries and only Lithium Ion batteries (aka LIBs) have a risk of explosion. That is part of why they are more expensive: all LIBs have an on-board computer that monitors internal temperature and shuts down the battery if it gets too hot. That is why your phone, or laptop, will shut down if you leave it in your car. So, LIBs are manufactured to be safe and, in fact, there are very, very few instances in which they explode (of course we only hear about the few cases in which they do explode so the news makes it seem like they are more dangerous than they really are). In general, it is best to avoid heating any battery as it can sometimes cause damage to the cells and reduce its lifetime. So, unless you are charging a tiny battery with a HUGE solar panel, you do not need to worry about a battery exploding. Like I mentioned before, this design works on a "trickle charge" effect, so there is very little risk of damage to the battery. Using a photovoltaic panel w/out a battery prevents you from storing energy, which means you can't use it the charger night or when the sun isn't shining. That is not a good design because it is not functional when you most need a charger. Thus, the battery is essential to the design. 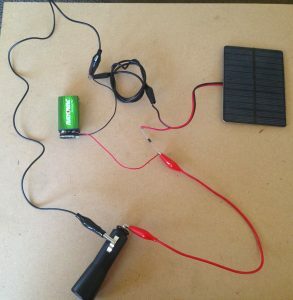 could one ad a/several car battery(ies) to a bigger solar panel? and if that were possible would one have to add more diodes or exchange with higher capacity diodes? good idea! and good question, ha. it gets a lil' bit trickier if you have a higher power system, but fortunately if you're only going for DC loads it is still doable on your own. You'd definitely need a higher rated diode, maybe even a fuse, since you'll have a lot more current in a higher power system. However, the basic concept is the same: panel charges a battery, battery powers the load.